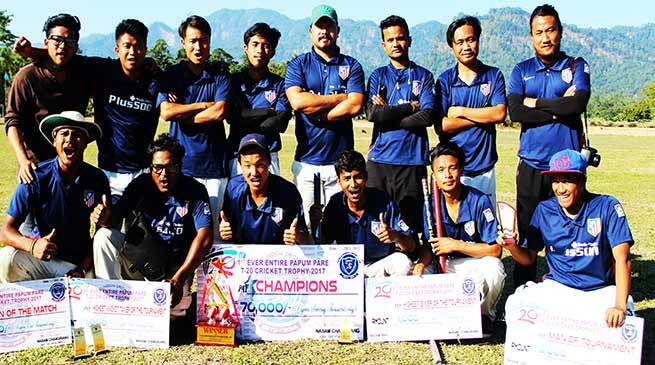 The Nirjuli Cricket Club lifted the first ever Entire Papum Pare T-20 Cricket tournament defeating Golmal 11 by 7 wickets here at Nabam Rungkhi Multipurpose playground today. After winning the toss Golmal 11 decided to bat first and scored only 84 runs in 17 overs after losing their all wickets. Babulal of Golmal 11 scored highest 25 runs for his team. Manish Saha took 4 while Takar Paza, Sandeep Kumar Thakur and Licha Tehi took 3, 2 and 1 wickets respectively for the winning team. Chasing the small target of 85 Nirjuli Cricket Club achieved the required run in just 13 overs losing their 3 wickets. Kamsha Yangfo, Netaji Teron and Sarfaraz scored 31, 26 and 5 runs respectively for the winning team. Manish Saha was awarded man of the match and highest wicket taker while Kamsha Yangfo and Netaji Teron was declared highest Sixes in the tournament and man of the series. The tournament was organised by Nabam Rungkhi Cricket Club. Altogether 13 teams participated in the tournament. Earlier while attending the programme as chief guest executive engineer PWD Doimukh division Nabam Tado appealed youths to maintain discipline while playing games. The former Pradesh Councillor of NEFA Nabam Rungkhi also spoke on the occasion. The tournament was organised by Nabam Runghki Cricket Club.